Don’t be a yo-yo. No, this isn’t the latest street slang. In fact, this is probably one of the most critical pieces of job search advice you need. When you make the decision to search for a new job, acting like a yo-yo will almost guarantee failure. What constitutes a yo-yo job search? Picture this: You’ve had a bad week at work and decided that’s it, you’re leaving. You send out resumes and connect with a recruiter who is interested. The next week, well, things aren’t so bad so you’re unsure if this is the right time. You’ve already made a few interview appointments and don’t want to burn any bridges so you go. But your uncertainty shows and you end up wasting their time and yours. The recruiter you chatted with has been burning up the phones on your behalf. Now you call and let her know you’ve changed your mind. More time wasted and that great first impression you made is gone. Now is the time to get clear about where you are now, and where you want to be in 12 months, 2 years and 5 years. Take the time now to decide what sort of environment suits you, what skills you enjoy most and are best at, what you need to learn, and what size or type of company you want to work for. Next, create a strategy to get there. And stay committed to your plan. Good days or bad days, commitment is key. No job is perfect. 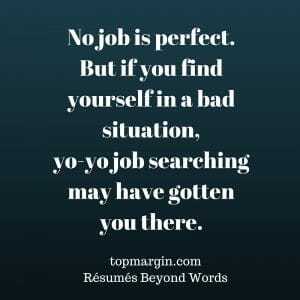 But if you find yourself in a bad situation, yo-yo job searching may have gotten you there. Doing the homework and sticking to your strategy may very well help you prevent any future bad decisions. For instance, if you decided that you don’t like small companies, then don’t apply for a job at a small company. Want to avoid a long commute? Then don’t apply for a position a long distance away. Flattered by an attractive job offer after one interview, but the position involves doing something you detest? Don’t say yes, when your strategy tells you no. This all sounds easy, I know, but people do it all the time and then wonder why they are so unhappy. Part of making the commitment to a job search strategy that will get you where you want to be is a resume that is a true representation of what you want, not what you think the next interviewer wants. We can help you create a resume that supports your strategy and helps you target the right job, nothing wishy-washy about it. If you are interested in working with Gayle Howard—an executive resume writer, Certified Master Resume Writer, multi-award-winning resume writer, and Master LinkedIn profile writer, drop her a line now using the contact form at the link above. Gayle can help you get interviews for your dream job and bring the world of business to you by maximizing your exposure and connections on LinkedIn.